For more than 20 years, DEMDACO has designed and sold giftable products intended to "Lift the Spirit"-in times of celebration, when comfort is needed, or just to put a smile on someone's face. The hand-curated artisan gifts it develops and distributes are chosen for their potential to help people nurture goodness in the lives of others, celebrate family and friends, and encourage people to treat themselves. We partner with artists representing a wide range of styles and mediums, and whose work is consistent with our values. Products are curated through this filter, then carefully reproduced by skilled craftspeople around the world. Under the DEMDACO brand, product categories include Gifts, Home Décor, Entertaining, Fashion, Baby, Holiday, and Outdoors. Whimsical and animal shaped security blanket is inspired by Nancy Tillman's best selling children's books. 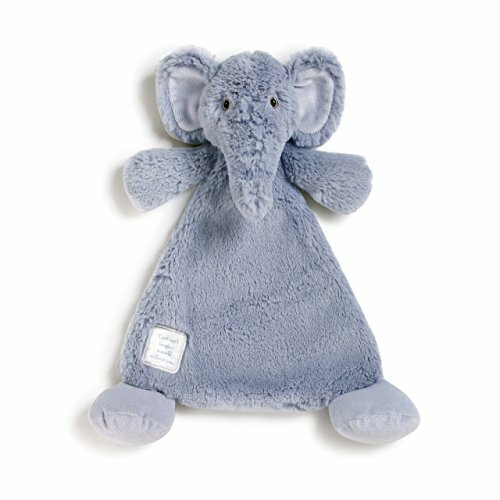 Super soft lovie is easy to cuddle with and features sentiment, "You are Loved". A thoughtful present for a baby shower, new arrival or adoption celebration. Sensory fabrics and rattle give will surely make this plush toy a child's favorite. To maintain the snuggly softness of this baby blankie, machine wash in gentle cycle and air dry. Plush fabric is soft to touch and easy on little cheeks. Pack in a bag when on the go, this blanket is convenient for travel. Measures 12 inches tall from stuffed head to paw. Sized just right for a playtime pal anywhere. Small blankie for bedtime and naps at home and away. DEMDACO Elephant Blankie by The Nancy Tillman Collection. Ships in protective packaging and ready for giving. Whimsical and animal shaped security blanket is inspired by Nancy Tillman's best selling children's books. Super soft lovie is easy to cuddle with and features sentiment, "You are Loved". A thoughtful present for a baby shower, new arrival or adoption celebration. Sensory fabrics and rattle give will surely make this plush toy a child's favorite. To maintain the snuggly softness of this baby blankie, machine wash in gentle cycle and air dry. Plush fabric is soft to touch and easy on little cheeks. Pack in a bag when on the go, this blanket is convenient for travel. Measures 12 inches tall from stuffed head to paw. Sized just right for a playtime pal anywhere. Small blankie for bedtime and naps at home and away. DEMDACO Elephant Blankie by The Nancy Tillman Collection. Ships in protective packaging and ready for giving. If you have any questions about this product by Nat and Jules, contact us by completing and submitting the form below. If you are looking for a specif part number, please include it with your message.